ok, no idea how great this is but will be more useful for Android users than iOS. Symantec’s Norton Mobile Security provides comprehensive protection for your Android smartphones and tablets, iPhones and iPads. It delivers powerful, effective protection for your devices against theft and loss. It can locate and track the movement of your lost or stolen device, remotely trigger an alarm, and provide additional security controls via web-based management.It also has contact backup that allows you to easily restore contacts across your mobile devices. Norton Mobile Security also provides some Android only features. The android version lets you remotely lock down or wipe your stolen device if necessary with a simple text message. You can also use the built-in webcam to take a photo of anyone using your device once you list it lost or stolen (webcam-enabled devices only). In addition, Norton Mobile Security for Andorid automatically detects and removes threats without slowing you down, so that you can enjoy all your favorite mobile activities without worry. It scans all files and app updates downloaded to your devices for malware, greyware, and helps protect against privacy risks such as exporting contacts, calendar, call logs etc. It prevent fraudulent (phishing) websites from accessing your personal information. It also Block unwanted calls and SMS text messages (phones only). Find your lost device on a map with the remote locate feature. Norton Mobile Security Premium is normally priced at $29.99 per one year serial number / product key on one device. 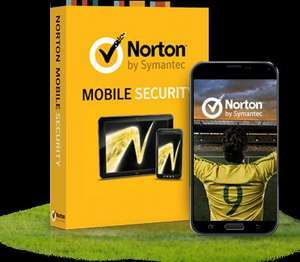 On the occasion of 2014 FIFA World Cup, Norton by Symantec is giving away Norton Mobile Security 1 Year / 1 Device license for free. Voted hot but they ask for card details. evertime I go to.checkout it says the basket is empty? Seems pointless for iOS. Everything and more available through Find My iPhone. Installed it previously on iPhone. Couldn't see what extra it did so deleted it. Wonder if its a nightmare to uninstall from mobile as it is from PC? It wont give me or anyone the code, does anyone know it. it wont give a code today, the submit button doesnt work. I'm going to expire this now. If you get your apps from verified sites you're as safe as your likely ever to be. There is no need for this kind of software. In case anyone else comes across this thread the Norton Yellow card promotion is not valid in this country.